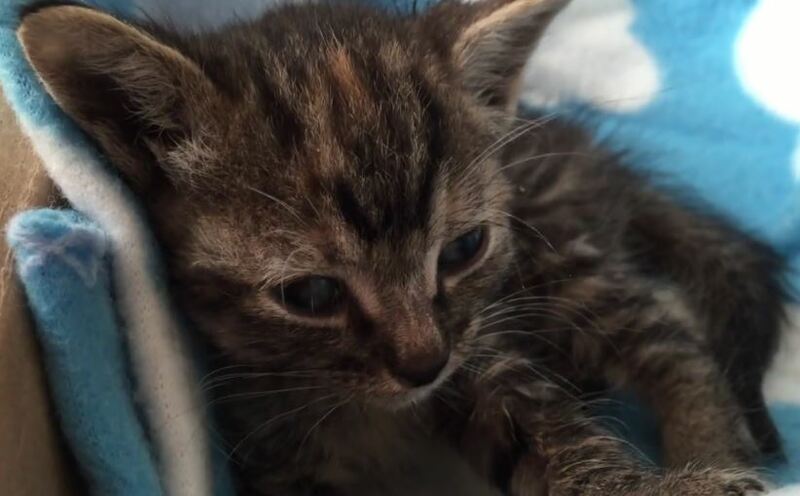 Here is the touching story of Enya, a kitten who was at death’s door when she was rescued but is now happy and healthy thanks to her foster family’s care. Enya was at death’s door when she was rescued by The Cat People, of Bakersfield, California. Her chances did not look good but she showed a will to live. Her foster family gave her round-the-clock care and now she is a happy, healthy kitten. She is a miracle kitten and she is a fighter. Enya’s foster mom tells her story below and in the touching video that follows. In early May, a kitten on death’s door step was brought to The Cat People. The little tabby with a touch of orange on her sweet face was emaciated, flea ridden, and could no longer walk. When I first saw her, I was devastated. She was in a box lined with a soft blanket, panting with her eyes closed. I contacted Barb because I felt the kitten needed to be put to sleep. I can’t stand watching an animal suffer. Just as Barb and I were texting, the little kitten raised its head and open its eyes. I was shocked. Then, she pushed her front legs up, holding her wobbly head up in a sitting position. I couldn’t believe my eyes! This kitten was trying to tell me she didn’t want to give up. I immediately grabbed water and NutriCal, and slowly dropped some water onto her tongue. To my amazement, the little kitten lapped up the water I gave her. I careful placed some NutriCal gel in her mouth, and she swallowed it right up. After I repeated the process a few times, the little kitten laid back down to rest. The next morning, Barb took the kitten to the vet hospital. She got fluids, worm treatment, and special high calorie food. The kitten appeared to be the size of a two week old kitten, but the vet said she was at least six weeks old. The kitten continued to get stronger every day. 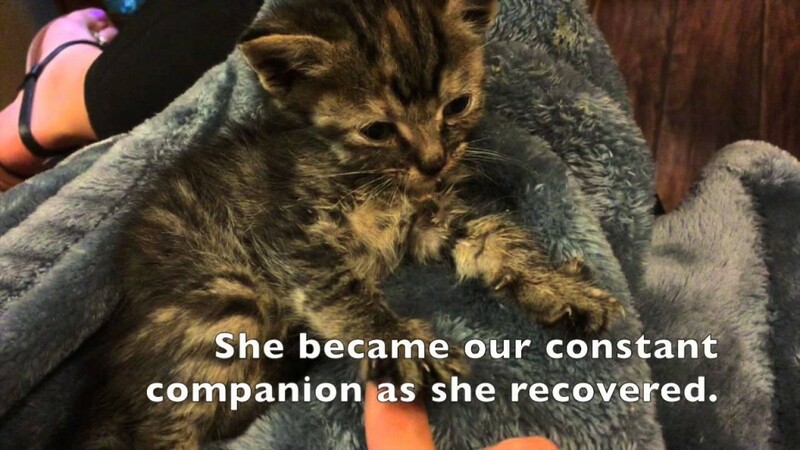 She started eating on her own after a couple days, and by the third day she was purring again. She built the muscle back up in her body and can now walk, run and play like a normal kitten. I have never seen such a young animal with a stronger will to live. Little Enya will remain in foster care with me until she is big enough for adoptions. She enjoys hanging out with Mr. Lake and playing with my chihuahuas. She really is one of a kind. Enya has reached a milestone along her journey: She will be at adoption hours tomorrow at Petco on Rosedale Hwy in Bakersfield. The Cat People is accepting donations to help cover Enya’s medical bills that occurred with her emergency vet visit and routine care. You can visit, like and follow The Cat People at Facebook. Who are The Cat People? They are a rescue organization founded in 1990 to help the stray, feral, unwanted and forgotten cats of Bakersfield and Kern county, California. More than an organization, they are passionate cat lovers who do their best to help cats in need. The Cat People and their dedicated network of volunteers and foster care givers have taken it upon themselves to do something about the deplorable state of affairs for many local cats and to help those cats to have good and safe lives. What a wonderful loving story of Enya ! I so pray she gets into a loving forever indoor home !! Thank God for the cat people who saved this little fighter ! They are amazing heroes !